Hello sweet people. I thought I’d join in with Kim Klassen’s Texture Tuesday again. I always love her challenges. Today we had to use one of her textures and a word in our photos. I chose to use her Just Cause texture and, as you can see, the word Bloom. Mmmm…bloom, such a wonderful word. It brings to mind something that is growing and flourishing…becoming all that it was meant to be. I’ve been hoping and wishing and praying that I would bloom. Perhaps through this blog of mine. That was the reason I started it, you know, to find my way back to me. “As long as we are persistence in the pursuit of our deepest destiny, we will continue to grow. Hi Tricia, I am out of town and on my hubbys lap top and just checking my blog etc and actually on a kind of vacation, but just wanted to pop in before I turn in for the evening and your blog was up front (lol) and I just want to say your blog is such an inspiration to me and all I have to say is you must be a very beautiful person to have such beautiful photos and to write as beautifully as well. Beautiful photos, I lake it! and a great font for "bloom". Simply lovely! So soft and dreamy! That first one makes me think of a magazine add–such a great composition and font choice! Your images are so soft and pretty, a perfect match for the text! Your photography blows me away, you are so talented! The poem you shared is so uplifting and I think the word bloom is just perfect! I love the quote, compliments your beautiful images very well. You are one of my inspiration in this blogging world. Soft and delicate! Still waiting for my pink peonies to "bloom". dreamy and beautiful. your images always make me smile. Really nice tones! I like the pic looking down on the flower with the spoons in the background best. Well done. So soft and dreamy, beautiful. oh my!! tricia… this is just lovely! truly!! So lovely…my 365 was a peony yesterday…I have more plans for those beauties. Happy Tuesday. This was my first visit and I must say that it was a very pleasant one. I'll be back to see more. These photos are so soft and lovely. Tricia, these are all amazing! Especially the first photo. It has a beautiful, ethereal quality. Tricia! Is your world always that dreamy, creamy place? It's just so beautiful. I'm so hopeful that my peonies bloom when the rain is gone. LOVELY! Love the softness of your images, Tricia…so "you"nique! You always have the prettiest photos and prettiest flowers! Blogging truly does help one to bloom! And your pretty blooms always light up my day. 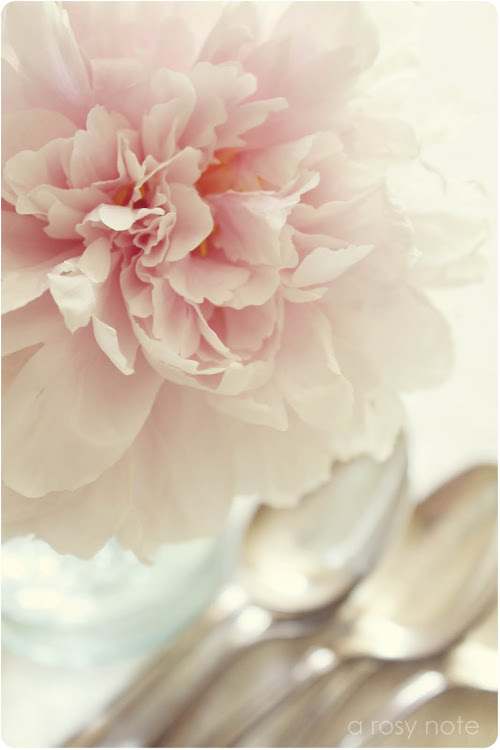 The peony images are simply beautiful. Love the images and I emailed you back. I'll try and explain how I did that mirror on my blog soon. such a pretty flower, great quote too!!!! Fabulous peony photograph, Tricia. Well done! This is insanely delicate and soft! I don't even know what to say. I'm just going to sit here and stare, wow. Amazing work. Beautiful photo's and I too just love the word BLOOM…I'm sure,after seeing your photo's this word is your's and sooo show's exactly that in your images – a beautiful inspiration "blooming" blog! Very sweet. Love the texture used here and the word, as well. your pictures are pure beauty! I loved the bloom in the jar so much I set it as my wallpaper on my laptop:) I look forward to your lovely posts! God bless! Your peonies are simply perfection! I just love them. They are one of my favorite flowers and your editing of the peonies make them more beautiful. What a wonderful shot.. So soft and pretty!!! What beautiful photos you take! What a wonderful post. Your pictures are absolutely beautiful and I love the quote. Yes, we all need a little encouragment to contiue to fulfill our dreams. And, believe me, you are blooming! Love, love, love these photos. You have certainly bloomed my dear! Lovely photos! The quote is so beautiful. We do bloom in our own time. Love the photos, especially the one that shows the ladder softly in the background. I was so intrigued by your photography that I had to go back and read the post. Beautiful and beautiful! Love the quote. Gorgeous photos! Your pictures never disappoint. I have come to the decision that the peony is my favorite flower:) Ours started to bloom this week. I'm a happy camper! Hope you're having a great week! This one is flying by. 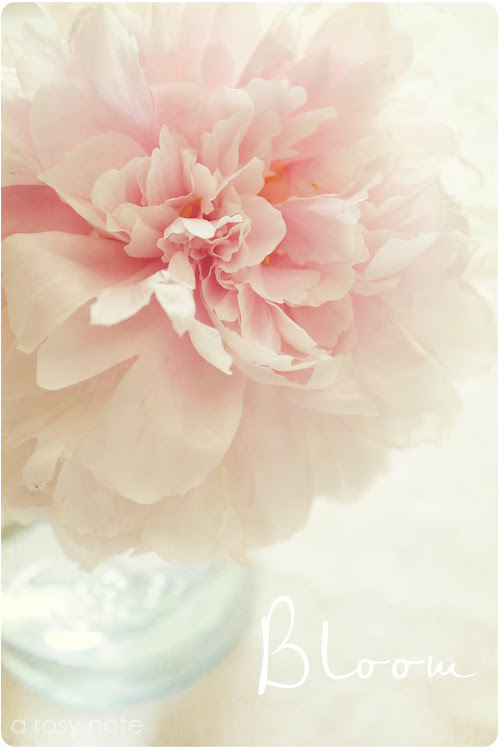 I'am peony obsessed right now….I love how soft your gorgeous photos are. 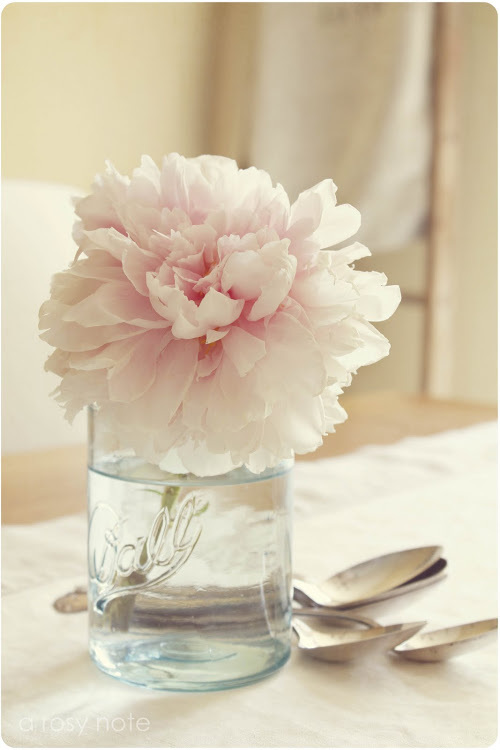 Like you, I adore peonies. Right now, I have a single deep pink one in a bud vase, and a lush bouquet of the softest pink ones in a pure, white pitcher. Lovely, as are the stunning photos on your site.